The tips below help you to quickly create a polished looking content page that works well with your conference app and looks great on mobile devices. Once you are done, copy the HTML source content and paste into the EventPilot CMS. Writing HTML code from scratch requires some HTML knowledge and it may be faster to use one of the many free online editors available to create your HTML code. It’s a good idea to look for one that doesn’t add extraneous HTML content, is still easy to use, and allows you to edit the source code. Please note that tables and large images can impact the viewing on mobile devices. Avoid large tables and follow the image tip #7 below. This is a serif font – like Times New Roman. This is a sans-serif font – like Helvetica. If the device has the font Arial installed, it will use it first. If not installed, it’ll check for Helvetica. If that’s not available either, it will pick a sans-serif font available on the device. Just like MS Word or Google Docs, your HTML editor offers the option to apply Header styles. Using those for your headlines guarantees that your pages look consistent within the app. 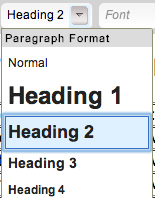 Only use Header styles for titles and headlines and avoid using different sized font within a paragraph of your page. Check your App Settings in the EventPilot CMS for your Primary Event Color. This color is used throughout different views within your custom app. You can take advantage of this color to create a page with a coherent visual appearance within your app. In the visual HTML editor, select your text and click on the font color icon. Select More Colors … and enter your primary color in the empty field. Ensure to include the hashtag # e.g. #37B05F. If you need additional yet complementary colors or the right shades or your primary color, try Adobe’s free Kuler tool to create your own palette. If, for example, you have a page where you are listing award winners, you could link to the award ceremony in the conference agenda so attendees can easily add it to their schedule. Or you create a page with event hours, you can link directly to the exhibitor tab in the app. Contact your Client Relationship Manager at ATIV and we’ll provide you with the URL to insert. If your attendees have Internet access, you can also add links to external web pages. One example is a “Concierge” page where you could list the different links to local information, local weather, or any other web links that could be useful for your attendees. If your attendees have good internet access at your venue, you can include images in the content pages. If the image file however is too large, it will take a long time to load and if the image dimensions are too large, the page will not look good on small screens. First, check the image size using any image editor including Paint on Windows or Preview on Mac. 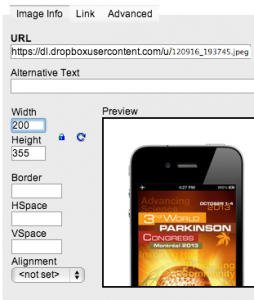 Using the image editor, resize the image to 300 pixels width. If you don’t have a server from where you can host the image, simply save it in your public DropBox (free file storage and backup in the cloud) folder, right click on the file and select Copy Public Link or Share DropBox Link which creates a URL you can use within your page. Selecting the little lock symbol and setting it to locked retains the image’s aspect ratio – ensure the display width is 300 pixels or smaller to accommodate the largest number of mobile devices. Your HTML Code could take up many lines and pages. There are free tools available that compress the code and remove unnecessary spaces. Try TextFixer.com paste your HTML there first, hit Compress HTML and copy the resulting compressed HTML into the EventPilot CMS.